Oregon seabirds and shorebirds line the 363 miles of Oregon coastline and the many inland waters, providing a great array of birds from puffins to swans. Some delicate little things with tiny thin legs and some huge hulking fish mongers. 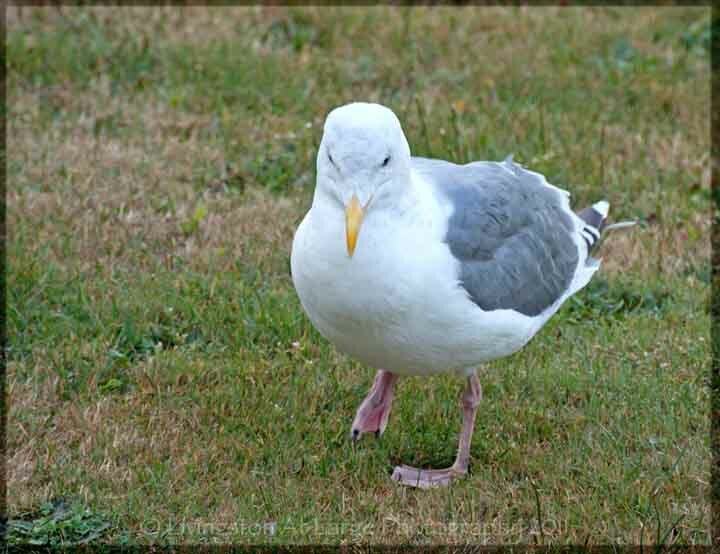 I, of course feel the need to photograph every gull from here to Scotland. I’m not sure why, after a zillion years working at Sea World, you would think I would despise the little evil clowns. is a super clean awesome place with a screaming great price on weekdays and very reasonable on weekends. They usually have a coupon in the travel magazine that sits in the stands outside of Shari’s or Burger King. This motel has great easy beach access for photographing sunrises and the owners were really nice. It’s my go to place in Lincoln City. There’s a sign on the window of the room that says “Please do not feed the birds.” The reason for this is so the birds don’t COME IN THE ROOM……Someone, for once, not me, (cough…Jerry) did not pay heed to that, and while this guy didn’t come in the room, he sure went and got his friends and there were a lot of squawking DANG gulls hanging out for a bit until they realized I was not impressed. I watched that episode of Two And A Half Men. I know not to invite seagulls in. I’m planning on renting a lens, a really long lens and an extender and trying to catch some puffins when they come in the spring. I really love puffins. 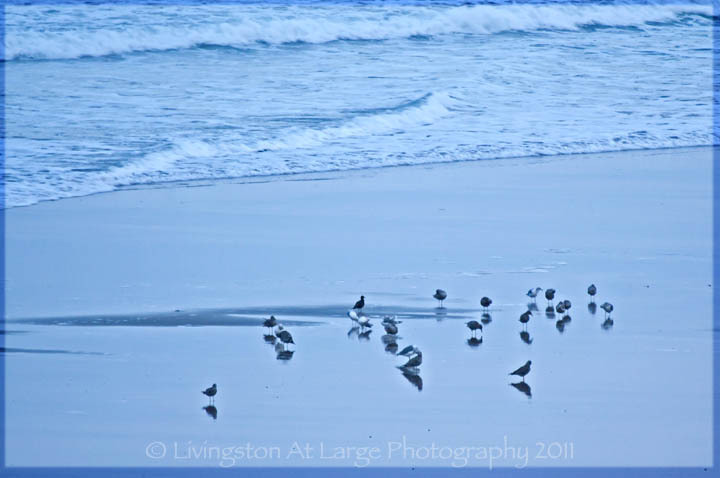 I was excited to find out that there are a few locations on the coast where they nest every year. 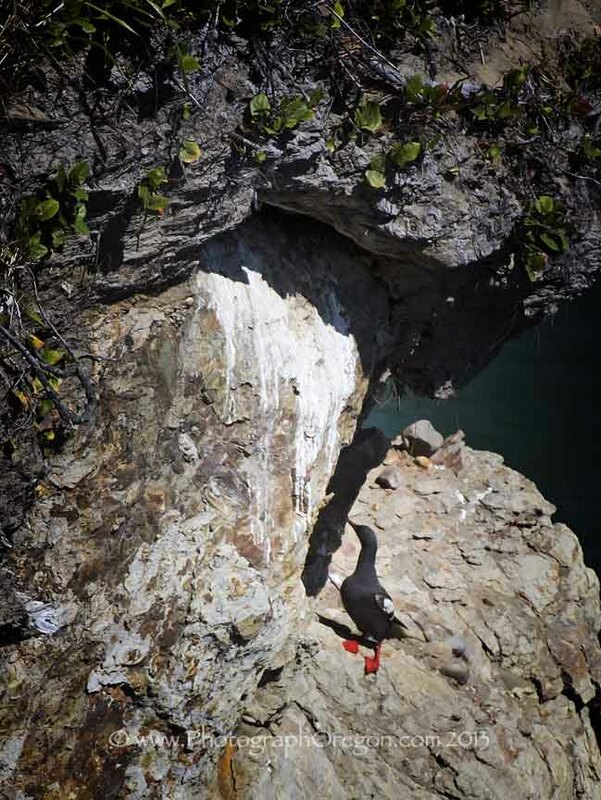 I did finally find some pigeon guillemots at Devil's Punchbowl. They are cute little things with bright orange legs and feet. (This was a life bird for me here.). Oregon ducks are famous. Oh wait not those ducks, I'm talking about hooded mergansers, goldeneyes and wood ducks, not the green and yellow ones that hang out in the Rose Bowl. A good variety of Oregon ducks can be found in local parks and water reclamation ponds. Drake Park and Mirror Pond are great places to find all the ducks I just listed as well as mallards and geese. 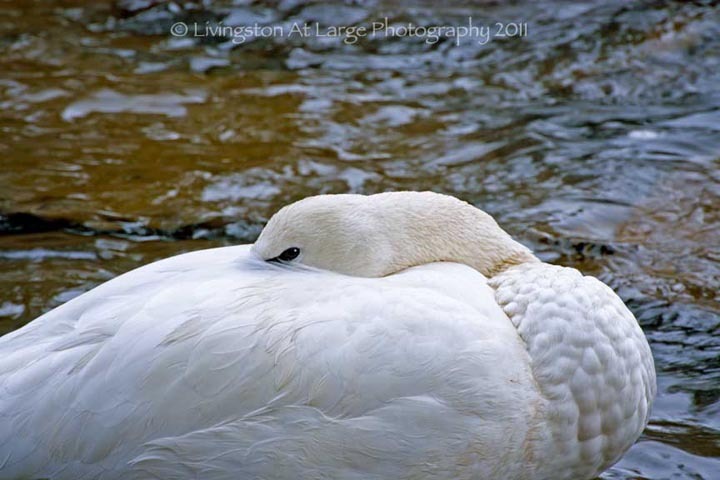 Sometimes there are also trumpeter and mute swans there as well. 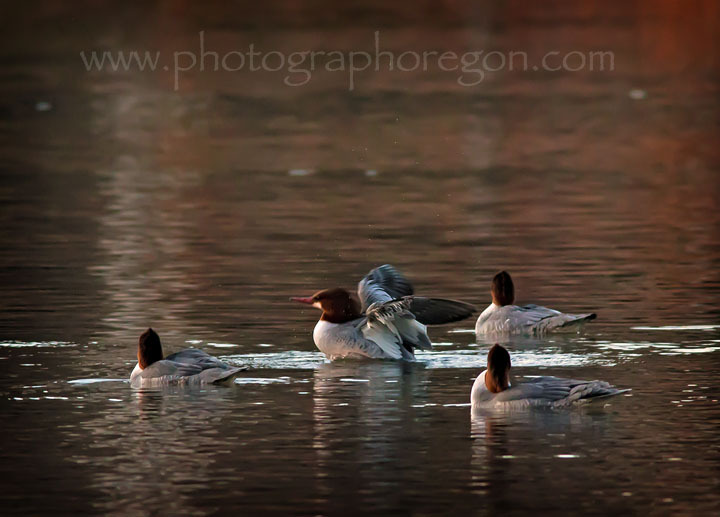 Here are some hooded mergansers near sunset. 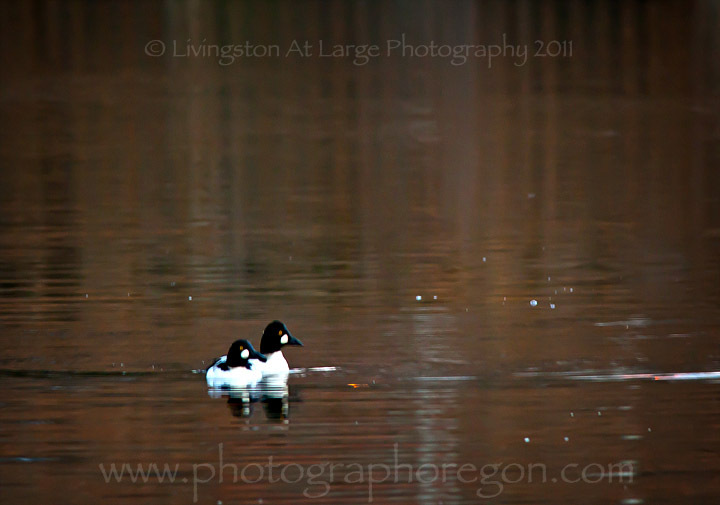 and a few common goldeneyes. They are fast little guys and hard to photograph. At the First Street Rapids Park in Bend, there are a lot of swans trolling the waters and they are easy to get close to for photographing. ...and almost anywhere you can find Canada geese. Often in the street blocking traffic but here they are on the Madras water reclamation ponds. 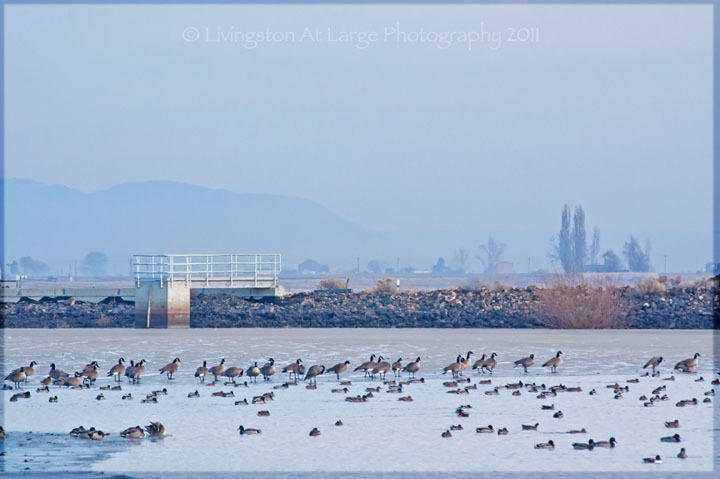 Love to photograph Oregon shore birds? Share your tips and images here!